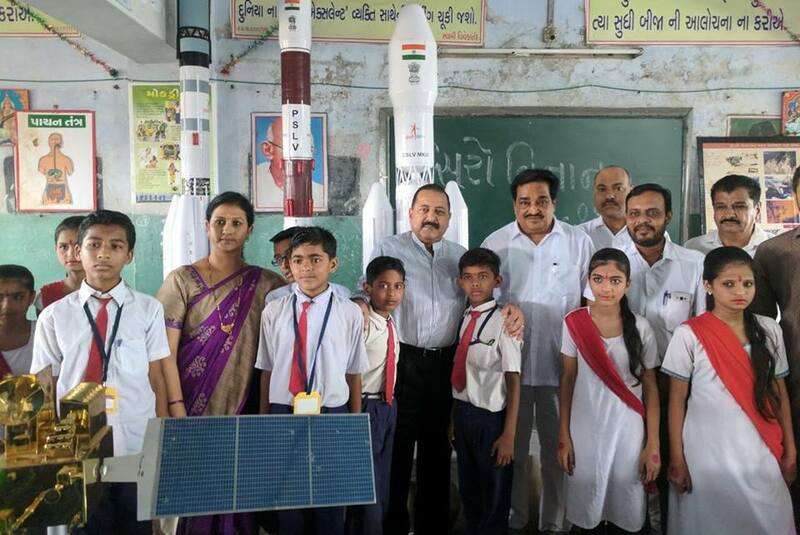 Surat: An exhibition highlighting the achievements of Indian Space Research Organization (ISRO) was inaugurated by the Union Minister of State of the Ministry of Development of North Eastern Region (Independent Charge), MoS PMO, Personnel, Public Grievances & Pensions, Atomic Energy and Space, Dr Jitendra Singh, in Surat, Gujarat yesterday. The exhibition was held under the aegis of Municipal School Board with participation by a large number of school children. The Lok Sabha MP Shri C.R. Patil, MLA Smt Sangitaben R. Patil and senior scientists from ISRO were also present on the occasion. Speaking after inaugurating the exhibition, Dr Jitendra Singh said that the founding father of India’s Space Programme, Dr Vikram Sarabhai was a son of Gujarat and therefore, this is the right place and location to celebrate the vindication and realization of Sarabhai’s dreams. He told the children that when his generation was in the same age group as they are, their only relationship with Space and the Moon was through poetry and songs on the theme of “Chanda Mama”. But today, India has taken over other nations in the field of space. While India under Prime Minister Shri Narendra Modi is on the threshold of becoming a world power in the coming years, Dr Jitendra Singh said, in the field of Space Technology, India has already emerged as a front-line nation after having overtaken countries like US and Russia which had started their Space programmes several decades before us. He said, when Dr Sarabhai and his colleagues began India’s Space Programme over half-a-century ago, there were no resources and not even a laboratory. But today, because of their efforts, we have reached a stage where the pictures and the visuals sent by our Mangalyan Mission are being procured even by the world’s most advanced centres like America’s NASA, he said. The story of Dr Vikram Sarabhai, Dr Jitendra Singh said, holds a moral for all the youngsters that they should never hesitate to dream big, but more important, at the same time, is to build up within ourselves the capacity and ability to realize our dreams and this can happen only through consistent effort and hard work. The function was followed by an interactive session of the children with MoS Dr Jitendra Singh.